The South Rim Cross Country Ski trail is located in the Black Canyon of the Gunnison National Park near Montrose, Colorado. 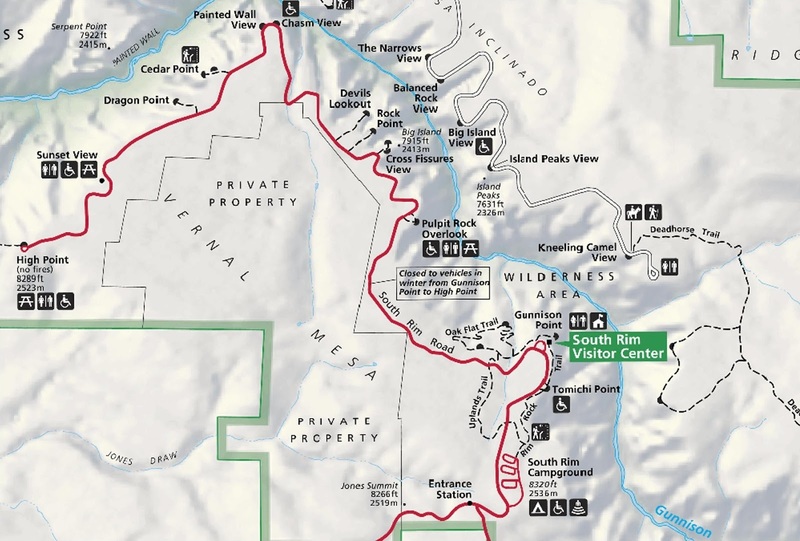 During the winter months between November and April the Park Service maintains the road for vehicle travel only as far as the South Rim Visitor Center. As soon as the snow gets deep enough the remaining 6 miles of the road, all the way to High Point, is groomed for cross country skiing. As a bonus they currently waive the entrance fee during that time. The trail begins at the north end of the parking area. You can stop in at the Visitor Center to get the current conditions before heading out. The trail is groomed with a classic track along one edge and an area for skate skiers in the middle. Snowshoers should avoid both of these areas and travel on the side of the trail that is opposite of the classic tracks. As the trail starts out it has a slight uphill grade to it. At the high point of the trail between the Visitor Center and Pulpit Rock the road leading into the North Rim section of the park is visible across the canyon. The North Rim section is closed during the winter but the access road is another option for Nordic skiing and snowshoeing for anyone in the Crawford area. After crossing the hump there is a nice long downhill run that has just enough of a slope to it for an easy glide but not so much to overwhelm beginners. Pulpit Rock comes up just under the 2 mile point. It is well worth it to trek the short distance to the overlooks. You can keep your skis on to the first overlook where there is a nice view looking upstream. The second overlook is a different story though as it is at the end of a craggy point. The views are pretty awesome from the second overlook and the whole experience of walking out to the point is unique in itself. Peering down at the gold medal fishing waters of the Gunnison River past the rugged canyon cliffs at this time of day one could see a short lived patch of sunlight that had reached all the way to the canyon floor over 1,800 feet below. For this post we turned around at Pulpit Rock and headed back the other way. When we had started out we were the first to arrive but on the trip back we ran into over a dozen other skiers. In our opinion the first 2 miles of the trail is a perfect stretch of anyone that is just learning to cross country ski and would highly recommend it for that. If you would like to see it for yourself then all you have to do is 'Take a hike'.